BoldGrid improves your workflow to complete client projects faster. No client is too small when you can create a beautiful WordPress website in less than an hour. Use BoldGrid Backup to protect and secure an entire network of sites. 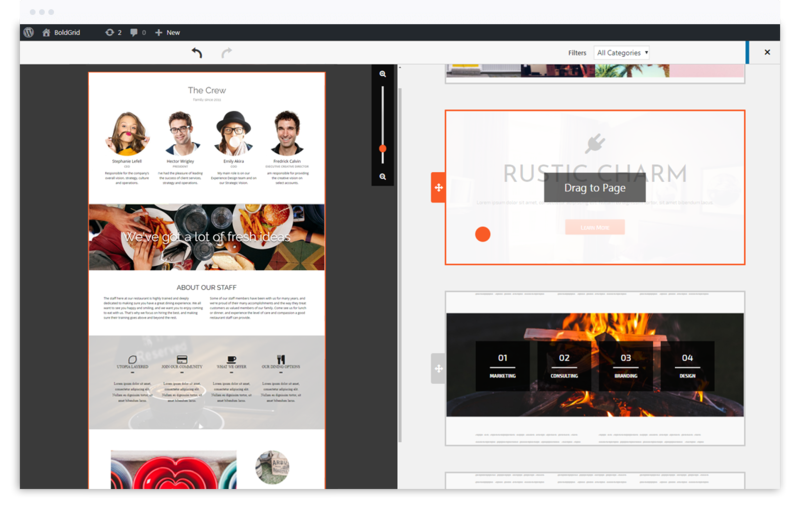 Turn your clients’ vision into their dream website faster than ever with our powerful Customizer tools, reusable row and column designs, library of preformatted page sections, pre-populated media gallery, and much more. Freeing up time means you can take on more and new clients. 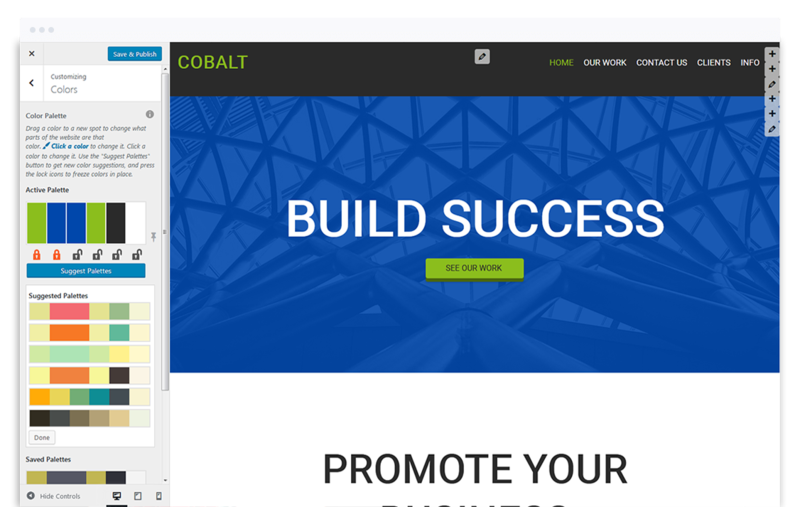 No project or client is too small when you can create a beautiful WordPress website in under an hour. Drag and drop and resize content, columns, and rows with precision directly on your pages – without using shortcodes. Empower your clients to take over their own edits and earn back your time. Use our preformatted page sections, Blocks, to quickly add new sections to a page. Or create a full page in a minute by selecting a few choice Blocks. Or create your own Blocks to save and reuse. 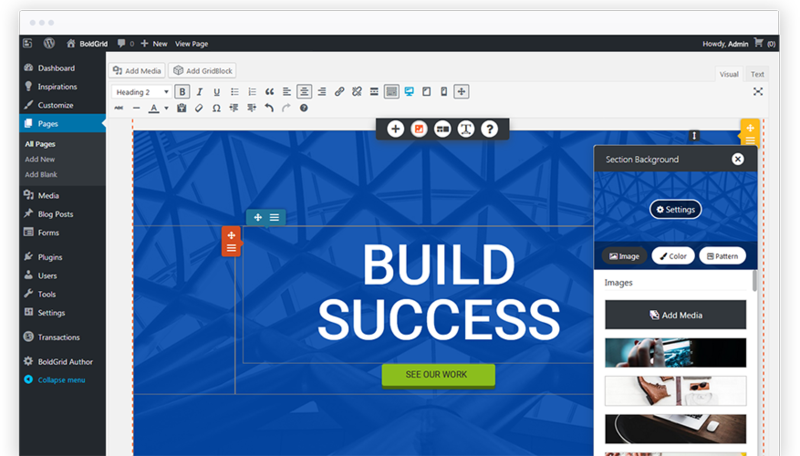 Create unlimited free BoldGrid websites with a single Premium subscription. Our BoldGrid Central portal will allow you to manage existing sites and create new BoldGrid websites on the fly. 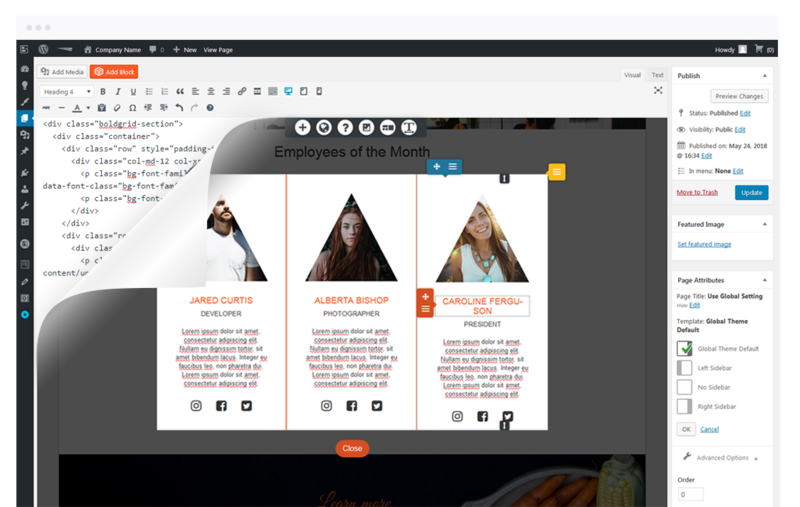 Edit your pages visually and drag and drop your content with confidence – without resorting to shortcodes or modules. The Editor is easy enough for anyone, but flexible for coders. This allows you to create custom solutions for your clients while empowering them to take over their own edits so you can take on more clients. Blocks are preformatted page sections consisting of images, text, and other page elements with plenty of variety from which to choose. BoldGrid will endlessly generate new Block design options that match your theme. Or you can create and save your own Block designs to reuse later. BoldGrid’s powerful Customizer settings allow you to edit elements of your theme quickly and easily. One simple window to make site-wide changes to menus, fonts, widgets, and more!